Aubrey Mayer will continue to coach Mater Dei High School’s sailing team. 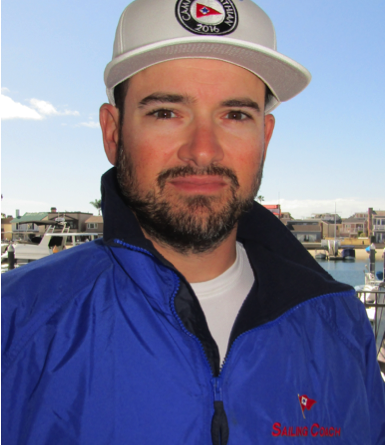 NEWPORT BEACH—Mater Dei High School sailing coach Aubrey Mayer was officially announced as Bahia Corinthian Yacht Club’s junior sailing director, on March 20; Mayer also served as the yacht club’s sailing coach before accepting his new position. The yacht club stated Mayer would continue to serve as head coach of Mater Dei’s sailing team; he coached the sailing team at Bahia Corinthian YC and Mater Dei since September 2018. A statement issued by Bahia Corinthian YC said Mayer previously served as the director of sailing programs at Orient Yacht Club in Rhode Island; he filled that position for 10 years while also living in New York. Mayer, a resident of Costa Mesa, most recently coached C420 racing at Bahia Corinthian YC; he was also the club’s technical director. “Aubrey brings an advanced high level of coaching to BCYC for the double-handed programs and has already helped recruit new young sailors not only from Mater Dei but other yacht clubs,” a Bahia Corinthian YC statement on Mayer’s hiring said. Mayer will be tasked with continuing the yacht club’s Starfish and Sabot programs, which is a pipeline for sailors. Other tasks as Bahia Corinthian YC’s junior sailing director include: ensuring the successful implementation of the U.S. Sailing Keelboat Certification Class; developing an adult keelboat program; and, growing the club’s double-handed program to bridge Sabot Sailors into CFJs and advance double-handed racing with C420/CFJ. Bahia Corinthian YC was founded in 1958 and was named Southern California Yachting Association’s Club of the Year in 1994, 1995, 1996, 2003, 2005, 2008 and 2011. Visit www.bcyc.com for more information about the club.